So the winner of this year's Meyer Travel Fellowship was announced, and it's not me- which means I don't get $5,000 to work on my project. But that is OK, because I started my project early so that in case I didn't get the grant, I had no excuse to not finish it because I had already started it. Growing up in Lima, Peru as part of the social elite was never easy for me. My father chose to be a navy officer and my mother a schoolteacher, so while many of my close relatives had immense wealth and status, I only had the family name. I felt both like an outsider and an insider at the same time. Peru’s upper class consists of approximately 3% of the total population and is concentrated in the city of Lima. The Peruvian elite has chosen to isolate itself, geographically and intellectually, from the serious economical and social problems affecting the country. My father’s job provided him with many benefits (maids, chauffeurs, cars) but a very low salary in return; in our case we had all of the signifiers of wealth except for wealth itself. I have grown up with privileges that 97% of my country couldn’t enjoy. I felt trapped in a neighborhood and a school that were chosen for me in order to build relationships with fellow children from respectable families. I would like this project to address the lifestyle I grew up in and the bizarre social structure of the elite in which I was raised. However, I do believe there is an urgency to show how this structure defines the country’s overall social structure and prevents our society from evolving into a more inclusive one. I am proposing to photograph the Peruvian modern social oligarchy and it’s connection to the that from the 1800’s. 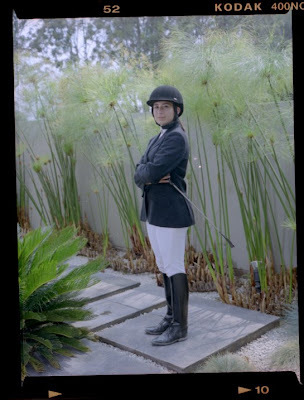 I am interested in making portraits of those belonging to the Peruvian social elite. I am particularly interested in photographing women as the makers of modern “refined” taste and status within this society. Culturally, the women arrange the hiring of maids, purchase the art for the house, plan exclusive parties and keep up with the latest society scandal. 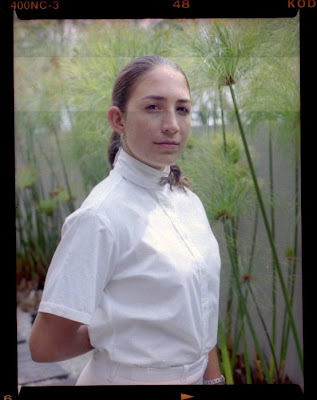 These portraits are not meant to critique the Peruvian social structure, but rather comment on the elite’s structure: The structure within the structure. European influence is one of the components that make up the criteria for the Peruvian social elite. The racial composition of the upper class is predominantly white; people of light skin, light eyes and/or light hair are extremely rare in Peru. I intend this project to be viewed by a North American audience, who may perceive the subjects as predominantly natural in complexion, when in fact the subject is a minute localized portion of the Peruvian population. I want to place the photographs in a context where the subjects constitute a racial majority, even though they contextually represent a minority. This would in turn disturb the structure of the elite by eliminating one of the components that defines it: the racial idiosyncrasy. Of course there is a lot more to be discussed and what not. A lot has to do with my own personal experience with this subject. I have several pages of writing that I've been doing and I'm sure the project will evolve as I work on it. 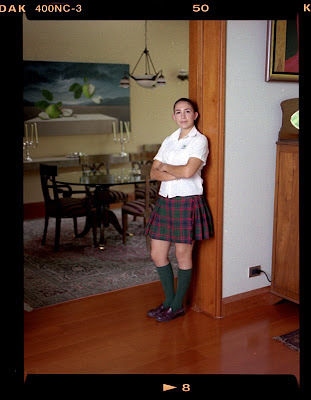 The following are photos I took of my cousin, some in her equestrian uniform and some in her school uniform, she attends an elite British Prep School in Lima.